Invite your friends, stoke the fire, and get ready for our biggest and best day of the year: Silent Night Day 2016! We’re excited to throw our annual Silent Night Release Party this year on Saturday, November 19, 2016, and it's going to be our biggest one yet! The party starts at the brewery at 1pm. featuring additional ingredients that will be available exclusively on Silent Night Day at the Mother Earth Tap Room! More information will be available soon on the featured variations of Silent Night that will be available, so stay tuned here for the latest news! 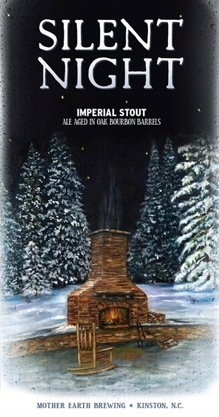 The 2016 Silent Night 750ml bottles will be available for purchase for the first time as well. Bottles are priced at $16 each. If you like BBQ, then you’ll be excited to enjoy some fantastic BBQ pork cooked right onsite by Mother Earth’s own Brad Smith, a 1st place winner at Kinston’s BBQ On The Neuse Festival! Sandwiches will be sold at the event, with 100% of the proceeds being donated to the smART Kinston City Project Foundation, which is working to build a vibrant arts and cultural district right in downtown Kinston. For more information, visitwww.smartkinston.com. We’re excited to once again partner with our friends at Counter Culture Coffee for this year’s batch of Silent Night. Each year, Counter Culture Coffee does a special roasting for Silent Night, and this year a representative from Counter Culture Coffee will be onsite from 1pm-5pm pulling FREE espresso shots using this year’s blend! Taste this fantastic coffee right alongside your Silent Night! We look forward to celebrating Silent Night Day each year. The party keeps growing larger, and so last year we decided that a commemorative poster was in order. The best part? We let YOU design it! We received a ton of great submissions for this year's contest, with the winning entry being submitted by Nicole Edwards of Chapel Hill, NC! Check out her design at the top of the page! These commemorative posters will be available on Silent Night Day, alongside the 2015 version. We plan to produce a new version each year, so collect them all! We want you to be able to join us and enjoy Silent Night Day responsibly, as well as experience all that downtown Kinston has to offer, so we encourage you to book a room for the weekend with our friends at Holiday Inn Express Kinston! Give them a call at (252) 559-8888 to secure your room. We’ll also be running a FREE shuttle to and from the Holiday Inn Express all afternoon and evening, so you can enjoy all of the festivities of the day and get you back to the hotel safely. Last year’s Silent Night release was once again the biggest party we have ever had here. We had so much fun hanging out with you all! We are looking forward to seeing old friends and meeting new ones on one of our favorite days of the year, at an event that is quickly becoming one of the best beer events in North Carolina! More information will be added here as it becomes available, so keep checking back for updates on the happenings of the day. We can’t wait to see you on Saturday, November 19th and share the Silent Night experience with you!